It has a learning curve, and It’s going to take me a while to build confidence, but I love it already. Riding fixed on city streets is a completely different ride and very difficult to describe. I will be commuting with it, and I’ll keep the board updated with my progress. I’ll also take some nicer photos when I find the time. This was shot on my MacBook and does not do the machine justice, but I’m flying to Santa Fe tomorrow and have more important things to do. Dude that’s awesome! 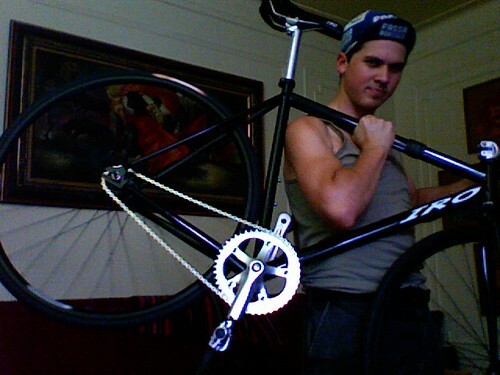 I’m going to switch the RedLine 925 to fixie this weekend and give it a shot. Nice ride Nick, how much did she cost ya? The bike is $550 standard – mine came to $650 after shipping, with Nitto bullhorns and a front brake adding to the original cost. Dude! That’s an awesome rig! I’ve been debating between an IRO and a Bianchi Pista. I’ll be waiting for your feedback! Well, you already know which I chose. DDSP 3rd National Night Out, New Cumberland, PA.